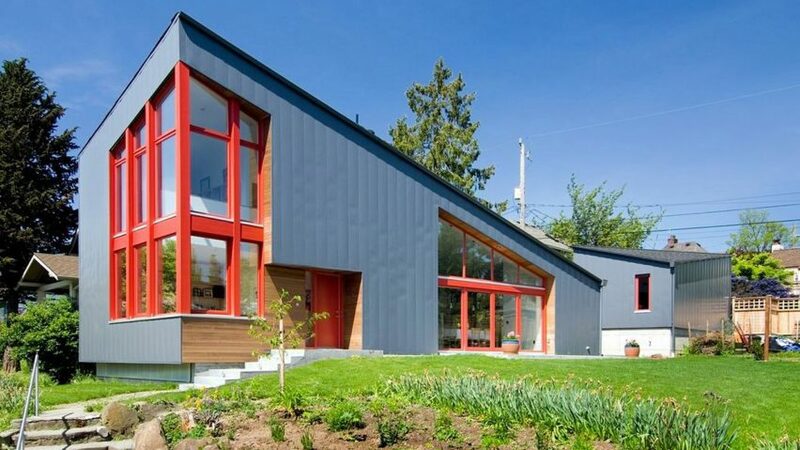 Seattle firms Stettler Design and Paul Michael Davis Architects have used bright pops of colour to frame glazing at this pointy home. The Burke Gilman House sits close to a bike trail of the same name in the Washington city, on a spacious plot with impressive views. "The design takes advantage of the width of a double lot and views of the lake, city and mountains toward the southwest," said Stettler Design. The studio worked with Paul Michael Davis Architects to design the home, which has an angular roof split into two portions. The front of the house is much higher, and the form steps down towards the back. Cladding across the exterior is mostly grey, but bright red window frames provide a stark contrast and enliven the facades. Glazing forms large sections of the ground floor walls, most prominently around a double-height foyer at the highest part of the angular building, and main living area at the back. The colourful window casings are also visible inside the house, where the plentiful natural light is reflected off white walls. The home's layout was designed for an active couple who plan to grow old there. "Primary living and sleeping areas are located on the ground floor, allowing for the owners to stay in the house as their mobility decreases," said Stettler Design. A master bedroom with en-suite is located off the entryway, which also leads to the open-plan living space in the wider rear section of the house. The upstairs only occupies the building's front half, and accommodates a further bed and bath, as well as a lofted space with a large corner window overlooking the mountains and bike trail. Extra storage space is provided by a basement, and a detached garage separated from the home by a small courtyard. Photography is by Dale Lang, unless otherwise stated.